Candidate filing opened Saturday for next year's elections in Texas, and it runs through Dec. 11. Though filing just opened, many candidates have already announced their campaigns for 2018. But with a month until the filing deadline, there is still some suspense on at least two fronts: Recent retirement announcements by three Texas congressmen have opened up seats for which the fields are still taking shape, and Democrats are still looking to fill out their statewide ticket with serious candidates, particularly the governor spot. Perhaps the biggest news of the day was that state Rep. Dan Huberty, the Houston Republican who chairs the House Public Education Committee, filed for re-election after months of uncertainty over whether he would run for another term. He faces a primary challenge from Kyle Stephenson. Republican Gov. 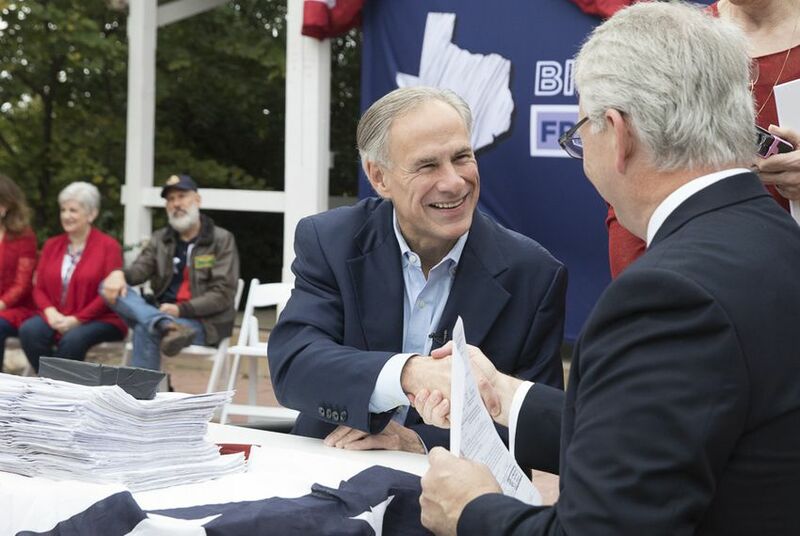 Greg Abbott, who is seeking his second term next year, marked the day — also Veterans Day — by holding an event at an American Legion post in Austin where he filed for re-election and unveiled a set of policy proposals aimed at veterans. "These veterans who have served for us, these veterans who have fought for us — they deserve a governor who will fight for them just as hard as they fought for the United States of America," Abbott said. "I am running for re-election to continue to fight for the veterans who have fought for our country." Abbott’s "Front of the Line" plan asks the Legislature to pass laws that would waive occupational licensing fees for veterans’ moving to Texas, allow veterans starting businesses to get personal property tax exemptions of up to $30,000 for the first five years of operation and encourage local governments to incentivize businesses to hire veterans by offering commercial property tax exemptions. Texas is home to the country’s second-largest veteran population, behind California. The Lone Star State’s expansive terrain makes Veteran's Affairs health facilities nearly inaccessible for veterans living in remote areas. Abbott wants to expand use of tele-health services to reach those living in counties without certain providers, such as mental health counselors and psychiatrists. Abbott is also calling on Washington to work with state officials to develop a model for expanding veterans’ ability to use VA funds not only to pay for care from providers of their choice in the market but also to buy private insurance. In addition to Abbott, a number of other Republican officials said they filed for re-election Saturday. The group included Lt. Gov. Dan Patrick, who made his 2018 plan clear earlier this year amid speculation he might challenge Abbott. In recent weeks, much more attention has been paid to the newly open congressional seats following the recent retirement announcements by Republican U.S. Reps. Jeb Hensarling of Dallas, Lamar Smith of San Antonio and Ted Poe of Houston. Saturday brought some news in Smith's 21st District: Susan Narvaiz, the former San Marcos mayor who has repeatedly challenged Democratic U.S. Rep. Lloyd Doggett of Austin, filed to run for Smith's seat. She joins state Rep. Jason Isaac, R-Dripping Springs, who announced Thursday he was running for the 21st District. The other big question as the filing period began: whether Democrats will land a serious gubernatorial contender. So far only little-known Democrats have lined up to take on Abbott, while a few more prominent figures — most recently Dallas County Sheriff Lupe Valdez — have said they are taking a look at the race. One other name cropped up Saturday: Grady Yarbrough, a perennial candidate who won the Democratic nomination for railroad commissioner last year, filed to run for governor as a Democrat in 2018. Hey, Texplainer: How much does it cost to run for office in Texas?